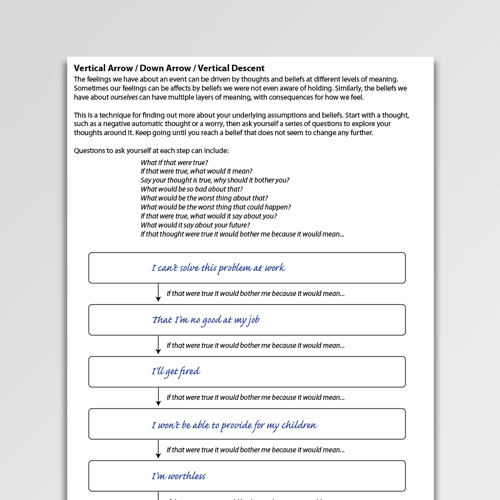 Vertical Arrow / Downward Arrow / Vertical Descent is a form of Socratic questioning in which the therapist asks a succession of questions to uncover intermediate-level and core beliefs. 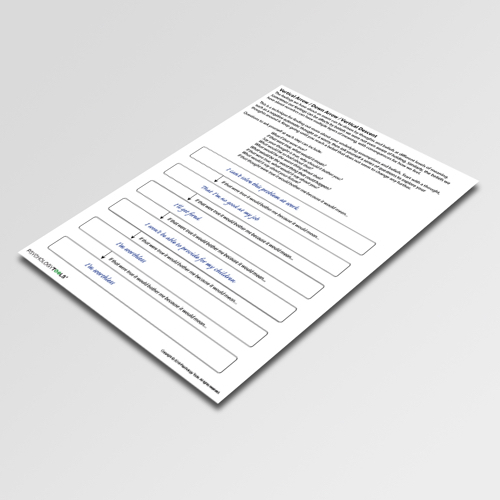 This information handout and worksheet introduces the concept and encourages clients to reflect upon meaning underlying surface cognitions. Vertical Arrow / Downward Arrow / Vertical Descent is a form of Socratic questioning in which the therapist asks a succession of questions to uncover intermediate-level and core beliefs. Automatic thoughts often reflect moment-by-moment concerns, worries, or fears (“I’ll be hurt”, “I won’t be able to manage”) and many individuals benefit from addressing any cognitive biases inherent in these concerns (i.e. working at this level of concern). However, the CBT model also conceptualizes underlying intermediate level and core beliefs which lead to the generation of (‘feed’) the moment-by-moment concerns. The Vertical Arrow / Downward Arrow / Vertical Descent technique allows the therapist to access the beliefs underlying current thoughts or concerns. The veracity and helpfulness of these underlying or core beliefs can then be explored and addressed. Therapists often use this technique as a series of questions within the flow of therapy. 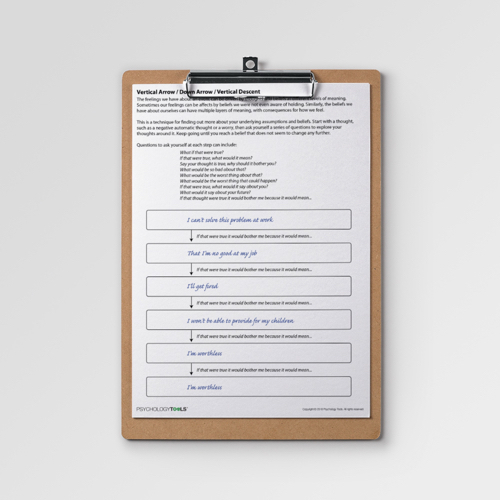 However, it can also be used openly / explicitly with a client by writing the current concern at the top, and then descending with the client through intermediate beliefs by asking questions such as “If that were true it would bother me because it would mean…”. When beliefs do not seem to change any further core beliefs have often been reached. 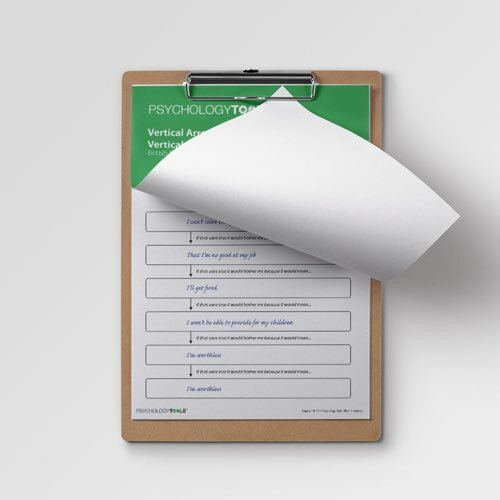 Clients can be instructed to use the technique as a homework exercise to explore beliefs underlying concerns that appear during their week. Care should be taken to use this technique compassionately as clients often access fundamental beliefs quickly, which some can find upsetting. Beck, A. T. (1979). Cognitive therapy and the emotional disorders. New York: Meridian. Burns, D. D. (1980). Feeling good: the new mood therapy. New York: Signet. Leahy, R. L. (2003). Cognitive therapy techniques: a practitioners guide. New York: Guilford Press. Merrell, K. W. (2001). Helping students overcome depression and anxiety: A practical guide. New York: The Guilford Press.